Though he later became a huge star in his own right, Popeye the Sailor Man began his career in an animated vehicle for the iconic Fleischer studios bombshell Betty Boop in 1933. More than three-quarters of a century later, his image is still instantly recognizable and the lessons he teaches kids are still relevant. These ten life lessons, as taught by Popeye, are among the positive things kids can glean from cartoons. Appearances Can Be Deceiving – At first glance, Popeye appears to be quite a rough customer. One wouldn’t assume that he’s in possession of exceptional mental faculties, but that assumption is proven wrong by his ability to suss out a situation in no time. Love Knows No Bounds – Despite Olive Oyl’s fickle tendencies, Popeye’s love for her inspires him to always come to her rescue. There’s very little that Popeye wouldn’t do for her, which provides a great example of loyalty to kids. Stars Can Come From Humble Beginnings – Though he went on to become the most popular cartoon character of his era and even to be the only cartoon character whose birthday was commemorated by the Empire State Building, Popeye began life as a small supporting character in a comic strip. Tough Guys Can Make Great Parents – After receiving an infant Swee’Pea in the mail, Popeye proves to be a devoted adoptive parent. This incredible example of single fatherhood and adoptive parents was far ahead of its time, and is still relevant with modern families. Guys With Big Biceps Can Still Have Big Hearts – While popular assumption is that muscle-bound men are tough guys with rough leanings, Popeye is a great example that making such generalizations can be absolutely wrong. 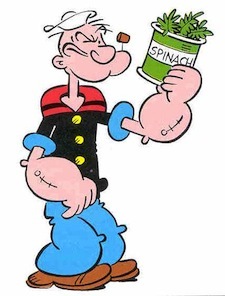 A Healthy Diet Makes a Huge Difference – The iconic image of Popeye swilling a can of spinach in order to achieve super strength is so ingrained in the collective cultural consciousness that the two are almost impossible to separate. The importance of a healthy diet is emphasized to young audiences of Popeye cartoons. Strong Characters Have Long Lives – The strength of a beloved, morally-upright character like Popeye is undeniable; decades after his original introduction, full-length feature films starring the sailor are in the works. Kids can get the message that being morally strong boosts a person’s impact on society. True Heroes Use Their Powers To Make a Difference – Whether he’s supporting war efforts or spinach farmers, Popeye the Sailor never hesitates to lend his strong helping hand to those in need, making him a great role model for youngsters. Patriotism is a Sign of Strong Moral Fiber – Popeye’s victories are often celebrated with patriotic songs and displays; additionally, he was heavily featured in shorts supporting war efforts during World War II. Proudly exhibiting such patriotic leanings is another of the lessons kids absorb from Popeye. It’s Best to Be Yourself – The refrain “I yam what I yam, and that’s all what I yam,”a favorite of Popeye’s, proudly celebrates the concept of being happy and confident with yourself and who you are, a message that cannot be passed on to today’s youth enough. Popeye has been and will continue to be one of the great cartoon heroes of all time, and a hero worth looking up to by all boys and girls.